Add zing to your favourite dishes with a layer of spicy pork sausage. Sobrasada, sold in Spanish delis, is a fantastic, incredibly versatile pork pate. Its flavour works well with seafood, honey and nuts, or eat it by itself on a cracker with a beer. 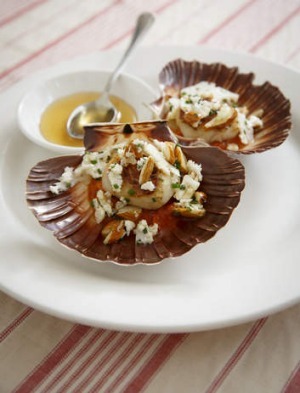 If you can't get scallops in the shell at this time of year, don't worry, they are just as delicious served on a plate or on a lavash for a great canape. Place the sliced cauliflower and chives in a bowl, dress with the oil and a good squeeze of lemon juice and season with salt and pepper. Place the cleaned scallops in a small bowl and season with salt. Heat a heavy-based pan with a little oil and when hot, place the scallops in carefully and sear on each side for 30-50 seconds. Spoon a little sobrasada into each scallop shell if you have them or on to four plates if not. Top with the warm scallops, two to a plate, then a spoonful of cauliflower salad. Drizzle a little honey over everything, sprinkle with almonds and serve.